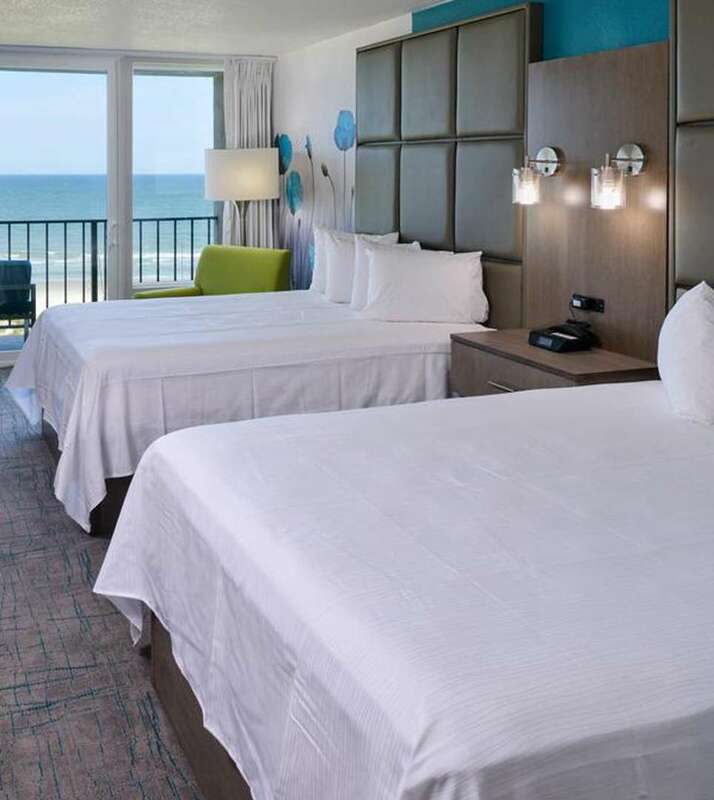 This spacious, Non-Smoking Oceanfront 2 Queen room Efficiency includes a large microwave and full-size refrigerator, induction plate, dishes, silverware, pots, pan, and cookware for your convenience. We want to ensure that your stay here with us is comfortable and stress-free so we provide Free WiFi, a work desk, and a coffee/tea maker in each room. Bedding is premium with a Simmons Beautyrest pillow-top mattress and you will have a 50" LED TV and iPod dock station with Wireless Bluetooth Speakers. Each bathroom has a premium shower, hair dryer, and a rainfall showerhead. You can enjoy the climate-controlled heating and air conditioning system. This spacious, Non-Smoking, Ocean Front One King bedroom with sleeper sofa includes a microwave and for your convenience. We want to ensure that your stay here with us is comfortable and stress-free so we provide free WiFi, a work desk, and a coffee/tea maker in each room. Bedding is premium with a Simmons Beautyrest pillow-top mattress and you will have a 50" LED TV and iPod dock station with Wireless Bluetooth Speakers. Each bathroom has a premium shower, hair dryer, and a rainfall showerhead. You can enjoy the climate-controlled heating and air conditioning system. This 2 Queen Bed, Side Oceanview Efficiency, offers 2 comfortable queen beds and can accommodate up to 4 adults. To ensure that your stay here with us at Cabana Shores Hotel is comfortable and stress-free, we provide free WiFi, a personal safe, a work desk, iron and ironing board, and much more. This spacious Non-Smoking Efficiency features a large microwave, full-size refrigerator, induction plate, dishes, silverware, pots, pan, and cookware for your convenience. 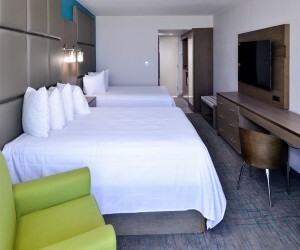 Each room has climate-controlled heating and air conditioning, and a private bathroom equipped with a premium shower, and a rainfall showerhead. This room also features a coffee/tea maker. Enjoy your premium bedding with a Simmons Beautyrest pillow-top mattress and black-out curtains so you are guaranteed to have a relaxing stay.